At Make My Day our sole supplier is the exceptional DEL BARRIO studio. This is a family-run craft workshop, established in 1934 and specialising in the design and production of leather items. DEL BARRIO studio introduced its own design studio more than thirty years ago and became one of the most professional and elegant representative samples of Made in Spain, with its well-known quality and contemporary designs. Unsurprisingly its main clients are leading companies and top governmental institutions and organisations. 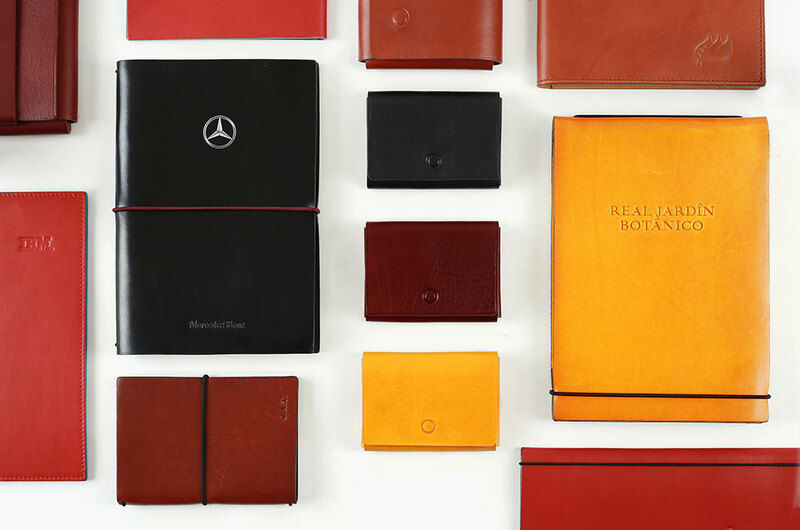 This partnership means that we can offer numerous customised options for both packaging and leather goods. From your company logo, the initials of your guests, the colour of the items, cases, etc. Ask for our samples and ideas. Our gourmet food products are a safe bet and delight both national and international clients alike. But they can also be used as the perfect gift to surprise them. From a small gift for guests at an event, a welcome pack with a touch of Spain or a delectable souvenir of their trip to Madrid. Award-winning oils, exclusive wines, cases with delectable fusions or amazing packs that offer a full sensory experience. At Make My Day we tailor-make your gift, offering you endless customisation options including your company logo, texts about the event, colours and even the packaging design.